In the quest for deploying efficient and scalable Oracle Application solutions to our clientele and keeping in line with the demands of the Digital Era, Widestreams constantly focuses and reengineers its methodology to suit the ever changing market place. This quest is met by using the latest and the best of Industry Standard Implementation Methodologies and Project Management Methodologies to arrive at a perfect mix that ensures successful and referenceable Projects. Widestreams ’ Implementation Methodology is based upon Oracle’s Proven and established Methodology namely Oracle OUM (Oracle Unified Method). 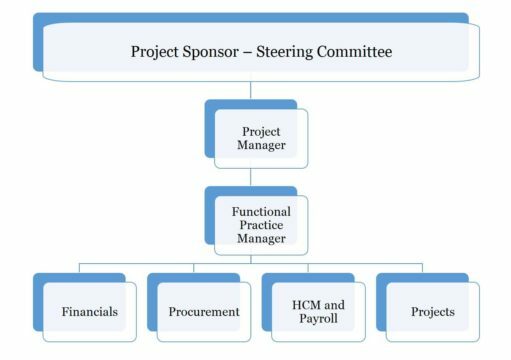 Based on Widestreams experience in similar implementation, we are proposing the following project organization setup, however we strongly recommend that a similar structure shall be created from D.G Jones part to match each consultant from our side with a super user from D.G Jones side. Widestreams uses the latest version of Oracle’s proven time-tested Methodology, namely OUM in its approach to Project Implementations. In addition to the robust capabilities of OUM, Widestreams uses the Project Management Methodology (PJM) for all its Projects. PJM addresses the critical elements of principles, practices and procedures for performing project management and marries the OUM Method and Process to the PJM result oriented approach in order to achieve the best of the conceptual and the practical worlds. Capitalizing on both Oracle Methodology’s flexibility and on Widestreams ’ extensive regional implementation experience, Widestreams merged OUM for Business Flows and PJM into a comprehensive methodology that covers both implementation and project management taking into consideration the regional business and cultural aspects. The outcome is a well-defined method based on the guidelines of the Oracle methods and taking into consideration the resource, cultural and budget regional constraints. Training – Widestreams strongly believes and advocates that intensive and appropriate training is imperative to the actual success of the project. Training events are followed up with a Risk Assessment and the issues are discussed and mitigated in a steering Committee. Widestreams identifies Knowledge Transfer and subsequent knowledge update and retention by D.G Jones teams as one of the most critical aspects that make a successful Implementation. Change Management – As part of the Project Engagement, Widestreams at various stages sets the tone for necessary changes that the organization needs to adapt to the changing realities. At a subtle level various visual tools like banners etc are displayed to create awareness. Widestreams also emphasises in steering committees the importance of this aspect so that the Project sponsor can proactively address this issue and create an atmosphere conducive to change. Integrated Approach – Widestreams Requirement scenario gathering and also the rest of the process is flow based. This necessitates and also creates awareness about the high degree of coordination and collaborative efforts between functions. This goes a long way in breaking the usual department centric individuals towards a Process/Organization Centric. While the milestones are discussed in the previous section, this section discusses another critical area of the implementation – Deliverables and Responsibility that are based on the previously discussed methodology OUM.